This can be useful if you have similar projects requirements for different clients or if you are an organization with the same tasks / projects that repeat over and over. Dooster allows you to set up a project once and re-use it again and again with various useful options. Then select the project you want to copy from the drop down. 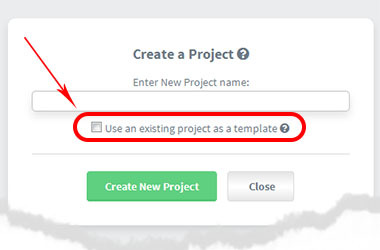 2) When creating a new project from a template, it is also important to note that any tasks which are marked as completed in the original project will remain completed in the cloned project. (If you want to uncomplete them simply use the “multi selector / action tool” that’s on each list. You can uncomplete up to 100 tasks with one click).